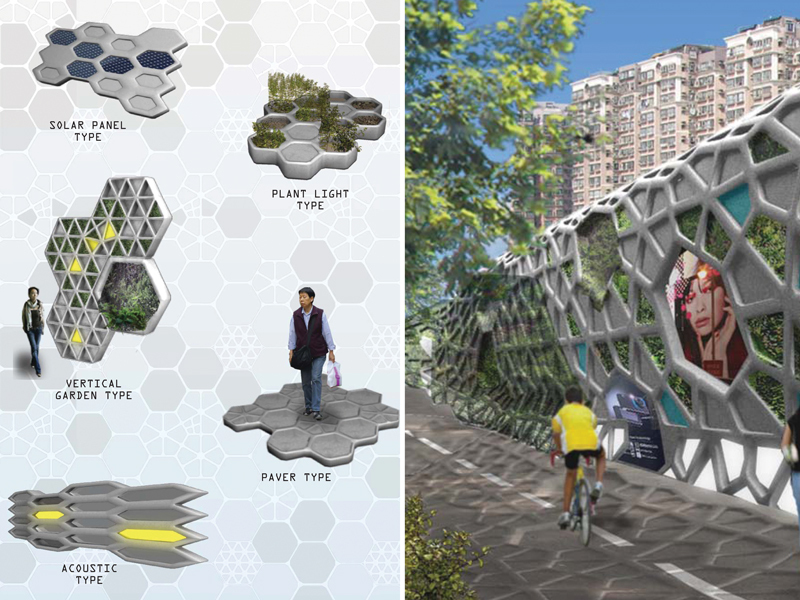 Our design approach for the noise barriers at the residential setting of Tai Po Tai Wo Road is to create a series of high-performance sound barriers that are aesthetically compelling, environmentally sustainable, and visually dynamic. We propose to achieve this through the use of a modular form —the hexagon— that can easily adapt to the complexity of the barrier type and unique site conditions. From the horizontal ground plane to the vertical barrier wall, the hexagon provides both the structural framework and visual consistency that can permeate throughout the project areas. The organic strategy that we employ allows for diversity with consistency, but without monotony. The barriers are constructed of a lightweight concrete lattice system infilled with various acoustical materials, including concrete pavers, insulated aluminum panels and transparent polycarbonate lenses. The barriers are further distinguished through uniquely tailored infills that synthesize the lattice structures into the residential neighborhood. These include flora cells featuring a variety of plant types, solar panel collectors, lighting fixture panels, and community-based info graphic panels. Our conceptual strategy for the noise barrier design at Gascoigne Road Flyover is to wrap the elevated highway in a continuous tubular lattice structure that achieves superior noise control and introduces an exciting new architectural element into the surrounding environment. The lattice tube is composed of a modular hexagonal structure constructed in lightweight concrete that varies in density and depth, adapting to the range of acoustical requirements along the 300M length. The design is uniquely woven into the cultural fabric of the urban neighborhood through a diverse array of program and uses made possible from the modularity of the tube structure. The concrete lattice hosts an array of infill types including colorful aluminum panels, transparent polycarbonate lenses, solar panel collectors, illuminated lighting panels, informational media displays, and an array of plantings. The insulated aluminum panels and transparent polycarbonate lenses provide excellent acoustical noise control and natural daylighting for the full and semi-enclosed sound barrier zones. The solar infill panels deployed along the southern face of the tubular structure power the lighting elements situated on the underside of the Gascoigne Road Flyover that illuminate the jade and produce markets, landscaped parks, and street thoroughfares. In zones where noise control is most critical, an innovative ‘sound blanket’ constructed of dense recycled rubber accumulations, wrap the lattice tube to provide maximum noise control, as well as a provocative aesthetic.